Return to the Troyer farm where, despite stressful changes occurring in their lives, Joel and Heidi once again open their Ohio home up to those seeking to learn about Amish cooking. This time a teenager helping her divorced dad cook for the family, a caterer needing new recipes, a food critic, a hunter looking to impress his buddies, a wife given the class as an unwanted gift, and a mailman lured in by the aroma of good cooking gather around Heidi s table. More than good food is exchanged, though, as friendships form, a romance blossoms, and hearts are healed." 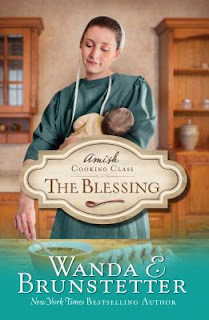 "The Blessing" is the second book in The Amish Cooking Class series by Wanda Brunstetter. I have enjoyed these first two books in the series and cannot wait for the third book. Wanda does a great job of taking the reader into the story line of the characters, which are characters we can all relate to. Heidi and Lyle continue to open up their home to six more students who want to learn how to bake. When Heidi doesn't get the baby she was planning to adopt, God had a different plan for the people she would adopt into her life. 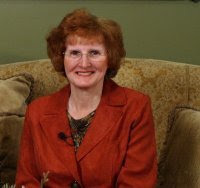 Heidi has a great time teaching her students new recipes and with each recipe comes a new Bible verse. Month after month, her students learn and grow, not just cooking, but about life. This book has some great elements of faith, forgiveness and helping others. I really enjoyed this book. I give this book 5/5 stars. A favorable review was not required and I was given a complimentary copy by the author.